SHERIDAN, Ark. -- In 14 months, the Sheridan School District will celebrate the grand opening of the $25 million, 148,000 sq. ft., two-story addition to Sheridan High School. After speeches are made and the ribbon is cut, the district’s students, faculty, staff and patrons will rush through the doors to get a glimpse of their new arena, cafeteria and classrooms. Though the addition is still months from completion, it is already opening many doors for students at the Sheridan School District. “Before we even started the high school construction project, we knew that the extra space and the 21st century learning environment of the new facility would allow us to offer more opportunities to our students, but it was not until we really started laying out plans that we understood the significance of what we could accomplish,” said Sheridan Superintendent Jerrod Williams. With new resources secured and a vision to inspire all students to reach their full potential, the Sheridan School District decided it was time to revamp its Career and Technical Education program. According to Williams, the new CTE offerings will do just that. CTE courses offer hands-on training and curriculum that can be transferred directly to careers. Students are able to see how what they are learning in CTE courses applies to the needs of employers. “When students see the relevancy of their instruction, they are more engaged and motivated,” said Williams. CTE courses benefit college-bound students as well. “The hands-on experiences give them an avenue to explore career options, strengthen their employability skills and help them get a well-paying job while they attend college,” said Jason Burks, the new high school principal who has a background in teaching CTE courses. Over the next two years, Sheridan High School will be rolling out new CTE courses in engineering, computer-integrated manufacturing, computer science, agriculture mechanics, entrepreneurship and pre-apprenticeship. The new CTE offerings are coming to Sheridan High School through the help of state and local business partnerships. The Department of Career Education awarded the district a $100,000 grant to purchase supplies and equipment. The Sheridan School District has been working with Kohler, a local manufacturer based in Kohler, Wis., for the past several months to develop curriculum and build a career pathway that will prepare students for careers in manufacturing. Kohler is donating $130,000 worth of equipment to support the development of Kohler Academy at Sheridan High School. The Kohler Academy, which will be located in the new high school addition, will feature a Kohler Robotics Lab with equipment actually used in Kohler manufacturing plants. The academy will consist of two career pathways: computer-integrated manufacturing (career track) and engineering (college track). Students who take the manufacturing track will receive training that will prepare them for a career at Kohler -- or another manufacturing company -- right out of high school. Students interested in engineering will be able to take engineering courses as early as 8th grade and continue their studies through the Kohler Academy. The district will use Project Lead the Way curriculum for the engineering and manufacturing courses. Project Lead the Way is nationally-recognized curriculum that includes hands-on, real-world activities, projects and problems that help students understand how the knowledge and skills they develop in the classroom may be applied in everyday life. Another exciting feature of the new high school addition will be the Yellowjacket store: YJ Nation Station. Students of the entrepreneurship class will have the opportunity to run the store, which will be located in the Yellowjacket Arena. Students will sell Yellowjacket merchandise and apparel and even items created by students in the Kohler Robotics Lab. A complete list of the new CTE courses with descriptions is available by clicking here. Students interested in enrolling in CTE courses for the fall semester may contact the high school and junior high (for 8th grade pre-engineering) Monday - Friday, 8 a.m. - 3:30 p.m. during the summer months. 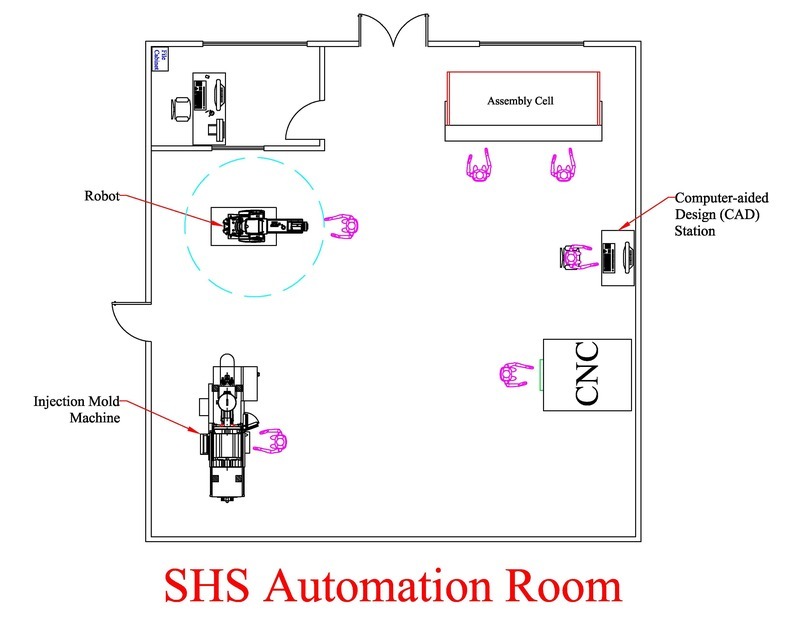 The new Sheridan High School addition, scheduled to be open to students in Fall 2019, will feature a Kohler Robotics Lab. The lab will be a part of Kohler Academy, a Career and Technical Education program, which is being funded in part by Kohler and the Arkansas Department of Career Education.